Ellen Hutson’s August Mix It Up Challenge is underway currently. This month’s Mix It Up Challenge involves using and Ellen Hutson product with any Avery Elle product. For my project, I’m incorporating the G’Day Mate stamp set made exclusively for Ellen Hutson by Avery Elle. I guess you could call it a two for one stamp since it counts both as an Ellen Hutson and Avery Elle product. When you buy the stamp set, you also get coordinating dies for the stamp set! This is great for me since I’m addicted to stamp sets that have coordinating dies. Since one of my cousins is expecting a new addition to their family, I thought I’d create a card to celebrate that. My mama kangaroo is carrying a new baby kangaroo also known as a joey. In Australia, a young child or baby animal is referred to as a joey. I really don’t know how that term came about, but I think it’s kind of a cute nickname anyway! Anyway the mama kangaroo wants the baby to know that he will be loved just like all of her other children. A mother’s unconditional love is forever! Using a cloud stencil, apply Tim Holtz Distress Oxide Ink onto an A2-sized piece of white cardstock. Move the stencil around to create and blend until you get the desired effect. Set this piece aside. Die-cut a piece of A2 embossed woodgrain cardstock with an arch-shaped die to create an arched opening. (Note: you can same the arch, the positive piece that was cut out for another project.). Put this piece aside. Stamp the kangaroo and butterfly images from the stamp set onto white cardstock with Memento black Ink. 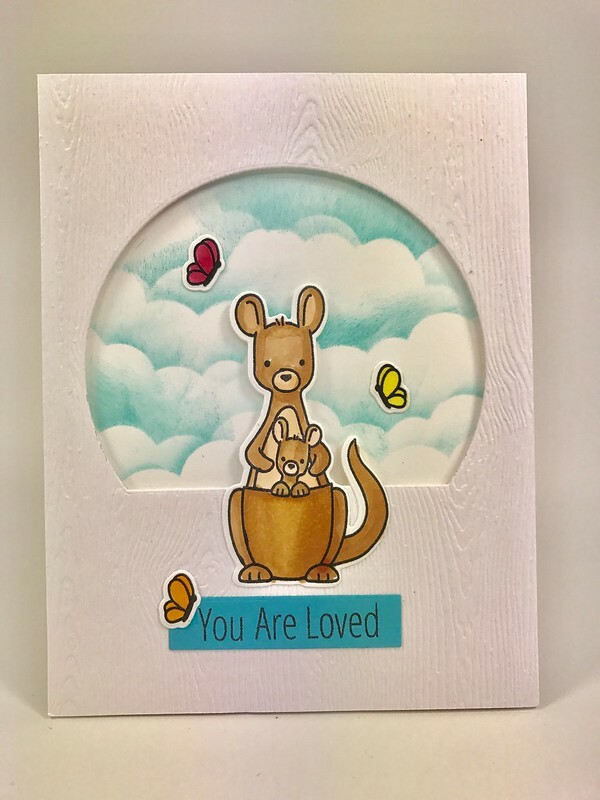 I stamped 1 kangaroo and 3 butterfly images for this project. I used Memento ink because I will color the images with Copic Markers and Memento ink is alcohol marker friendly. Color your images and die cut them using the coordinating dies. You could also fussy-cut the images if you are good at fussy-cutting (I am not). Stamp the sentiment in black ink onto a blue-colored cardstock that complements the clouds and sky. Cut out the sentiment with scissors into a rectangle. Adhere one of the butterflies to the sentiment piece. Glue the die-cut kangaroo piece to the woodgrain cardstock piece as you see in the photo. I centered the kangaroo in front of the arch opening so that the bottom half of the kangaroo’s body was on the woodgrain cardstock, and the top half was hanging off the open arch. Apply pieces of foam tape liberally to the back of the woodgrain cardstock piece and the back of the top half of the kangaroo. This is to raise the entire card front for added dimension. Remove the backing from the foam tape and place the woodgrain card piece over the stenciled cloud piece. The clouds should be visible through the arch opening. Glue the 2 remaining butterflies to the stenciled cloud piece. Place and adhere the sentiment below the kangaroo image. Mount the entire card front onto an A2 top-folding card base. Copic Markers: RV13, Y13, Y38 for the 3 butterflies; E21, E33, E55 for the kangaroos.